조선 중기의 집으로 영조 52년(1776)에 삼수부사를 지낸 유이주가 지었다고 한다. 풍수지리설에 의하면 이곳은 산과 연못으로 둘러싸여 있어 ‘금환락지(金環落地)’라 하는 명당자리로 불려왔다. 집의 구성은 총 55칸의 목조기와집으로 사랑채, 안채, 행랑채, 사당으로 구성되어 있다. 사랑채는 T자형으로 누마루 형식을 취하고 있다. 일반적으로 사랑채에는 큰 부엌이 없는데 이곳에는 안채 통로까지 겸한 큰 부엌이 마련되어 있다. 또한 사랑채와 직각을 이룬 누마루가 있어 전체 살림을 한눈에 관찰하도록 되어있어 특이하다. 안채는 사랑채의 오른쪽에 있는 건물로 사랑채에 비해 규모가 매우 크며 평면이 트인 'ㅁ'자형이다. 중심부분은 대청이며, 좌우로는 큰방과 작은방이 자리잡고 있다. 행랑채는 '一'자형으로 2칸이 앞쪽으로 튀어나와 누형식을 취하고 있다. 1칸은 방이고 다른 1칸은 다락으로 되어있다. 누각아래 기둥 서쪽에는 안채로 들어가는 길이 있는데, 층계로 하지 않고 경사진 길로 만들어 특이하다. 사당은 안채 동북쪽에 있는 건물로 따로 담장을 둘렀으며, 지붕은 옆면이 사람 인'(人)'자 모양인 맞배지붕이다. 운조루는 조선시대 양반집의 전형적인 건축양식을 보여주고 있는 건물로 호남지방에서는 보기드문 예이다. 이곳에는 여러 가지 살림살이와 청주성의 지도, 그리고 상당산성의 지도 등의 유물도 상당수 보존되어 있다. 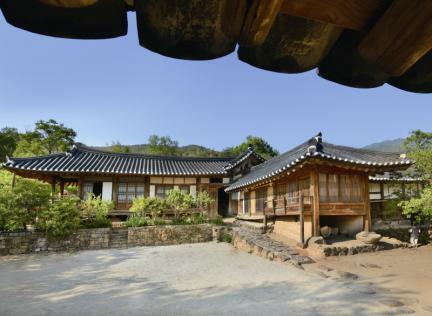 Unjoru House was built in 1776 (the 52nd year of the reign of King Yeongjo during the Joseon Dynasty) by Yu I-ju, who served as a magistrate of Samsu. 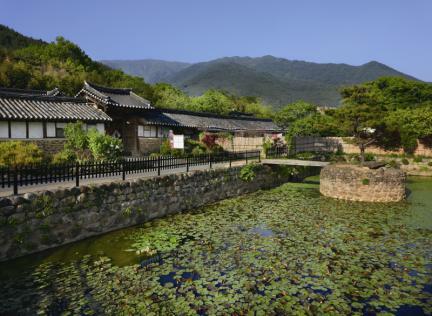 According to the principles of feng shui, the location of this house was considered a most propitious site, being surrounded by a beautiful natural landscape. 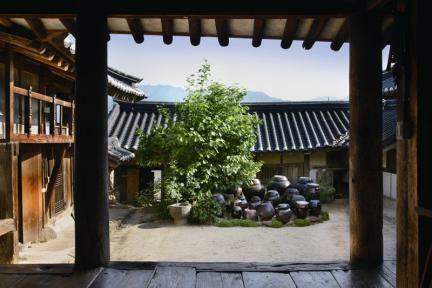 The house consists of wooden buildings with tiled roofs, including the sarangchae (men’s quarters), anchae (women’s quarters), haengnangchae (servants’ quarters), and a family shrine, and measures 55 kan (a unit of measurement referring to the distance between two columns) in total. The T-shaped structure of the men’s quarters of this house is particularly unique because, atypically, it includes a large kitchen. In addition, it includes an elevated wooden floor called a numaru, with railings encircling the whole wing. The square-shaped women’s quarters is larger than the men’s quarters (located to its left), and comprises a wide wooden floor hall in the center and two bedrooms at each side. 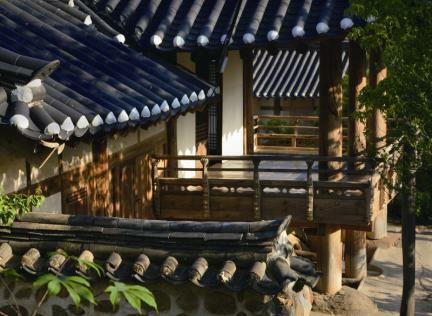 The servants’ quarters, measuring two kan, takes the form of a raised pavilion, and consists of one room and an attic. To the west of this pavilion building, there is a sloping passage leading to the women’s quarters. The family shrine located to the northeast of the women’s quarters is surrounded by separate walls and has a gabled roof. 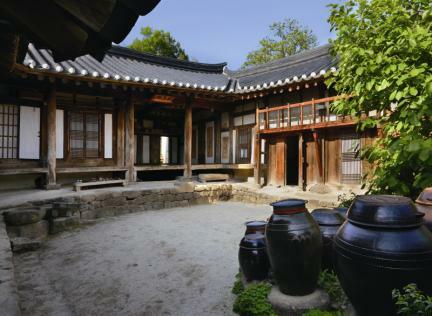 This house is a typical upper-class residence of the mid-Joseon Period, few of which can be seen in the Jeolla-do area. 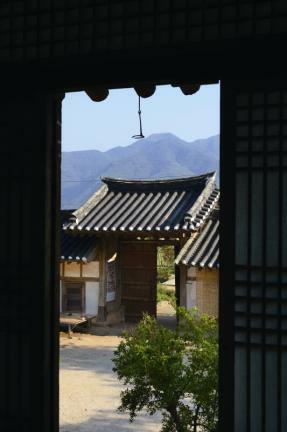 Various household goods and cultural heritages are kept here as well.